Located in the corner of the Lighthouse Commons off of Montauk Highway in Oakdale, O’Reilly’s Restaurant and Pub is a spacious pub with a seating and restaurant area opposite the bar. A stage is at the back of the pub creating anticipation for the evening’s entertainment. Arriving at O’Reilly’s the menu offers seven varieties of burgers including their famous Smokehouse Burger. The Smokehouse Burger, the burger they will they compete with in Battle of the Burger, includes smoked bacon, barbeque sauce, chipotle mayo, smoked gouda and fried onions atop a 10oz. all beef burger and finished with a soft and fluffy sesame seed roll. When the meal arrives, the thick 10oz. 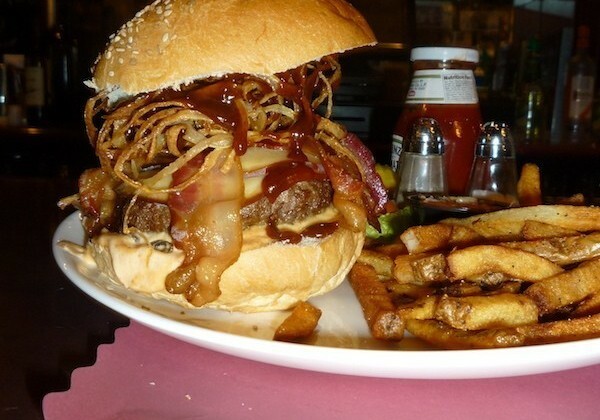 burger comes with 3 slices of bacon and is towering high with fried onions. Along with the burger there is a plentiful serving of peppered fries, a signature jalapeño and habanera coleslaw. Taking the first bite the smoky flavor is instantaneous as the combination of flavors wows your taste buds. The beef is juicy but doesn’t seep into the bun. The serving size is big enough to make one feel satisfied but leaves the eater yearning for the their next trip to the pub. A returning customer, when asked about the quality of his burger replied to Clinnin, “Excellent, as always.” The enthusiastic response form the customer is enough to leave a good feeling about the choice in the restaurant. Even if O’Reilly’s Smokehouse Burger doesn’t come in first in the Battle this year, Long Islanders are encouraged to pay some attention to this Oakdale pub for the meal and experience.